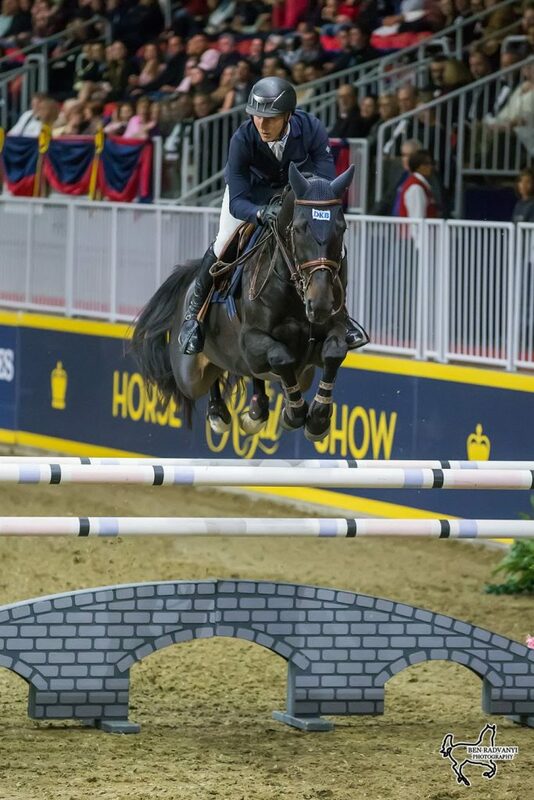 David Will of Germany scored his second victory in a row, winning the $50,000 Weston Canadian Open on Friday, November 11, at the CSI4*-W Royal Horse Show, held as part of the 94th Royal Agricultural Winter Fair in Toronto, ON. Hot off his win in Thursday night’s $35,000 International Accumulator aboard Cento du Rouet, Will returned to the Ricoh Coliseum with Calista to top a 22-horse starting field. Racing over the speed track, Will shaved more than two full seconds off the time posted by three-time Olympic medalist McLain Ward of the United States, stopping the clock in 51.20 seconds versus Ward’s time of 53.31 seconds aboard Malou. “There were many, many options,” said Will of the track set by course designer Bernardo Cabral of Portugal. “I decided into the second double to do five strides because she has a very big stride. Then you could do an inside turn again to the next one. The course designer asked everything from us – if we can leave out strides, if we can do short turns. It was a very nice course. U.S. rider Jessica Springsteen finished close behind in third place with a time of 53.77 seconds riding Tiger Lily for owner Stone Hill Farm. Ten-time Canadian Olympian Ian Millar was fourth in front of an appreciative home crowd, stopping the clock at 55.09 seconds riding Dixson, owned by Susan and Ariel Grange. Ireland’s Darragh Kenny rounded out the top five riding Cassini Z, owned by 2008 Canadian Olympic team silver medalist Mac Cone’s Sothern Ways. For Will, his first trip to Canada has been a winning one. In addition to bringing two of his own horses from Europe, he was reunited with Calista, a horse he rode as a seven-year-old. Now owned by fellow competitor Georgina Bloomberg’s Gotham Enterprizes, Bloomberg generously loaned her horse to Will for The Royal. Competition at the Royal Horse Show continues on Saturday with the crowd-favorite $15,000 Canine-Equine Challenge, presented by the Toronto Star, as the matinee performance, and the grand finale, the $75,000 GroupBy ‘Big Ben’ Challenge, to close out the international show jumping division. For more information on the Royal Horse Show, the marquee event of The Royal Agricultural Winter Fair, visit royalfair.org/horse-show.